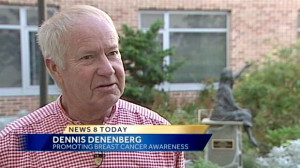 Dennis Denenberg, who once taught at Millersville University, has come up with a way to educate others about breast cancer. Breast-a-ville is held on campus to raise awareness about early detection and breast cancer research. He stared it two years ago in honor of his sister, Diana. “My dear sister battled breast cancer for 18 long years. Never complained, never asked, ‘Why me?’ and my efforts to promote breast cancer awareness are in her memory and to help others hopefully not go through the experience that Diana experienced,” Denenberg said. Denenberg also created a memorial garden in honor of his sister and will raise money to make the program available to other campuses. He will give a special performance Sunday at the Ware Center in downtown Lancaster called Hurray for Heroes.